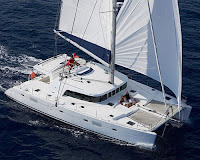 The 52.5' brand new 2009 Lagoon Catamaran Idea!. Sail Greece in style! Maximum comfort has been designed into this boat that features a forward cockpit with face-to-face seating, numerous lockers and a full view forward. Comfortably accommodating 8-10 guests in 4 double bed and one twin bed cabins, all with en-suite facilities. Air-conditioned through-out, large decks and the helm station on the flybridge or the main saloon entrance on the same level. Underwater lights for night swimming.